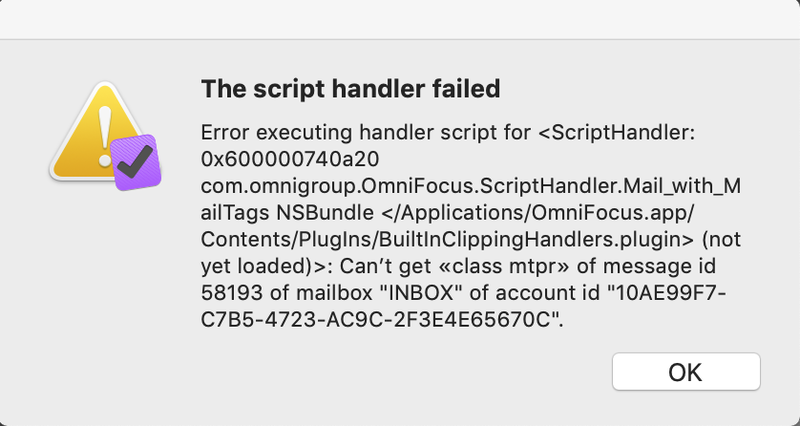 I’ve recently updated to Omnifocus 3, and to MacOS Mojave… and the Clippings Shortcut never works. The quick entry shortcut works fine, but not the shortcut to Omnifocus Services “Omnifocus3 : Send to Inbox”. I’ve tried changing the Shortcut, but with no result. I’ve gone into Preferences > Security and Confidentiality > Automation : Omnifocus has Mail and Safari clicked, so authorised. [UPDATE] : I’ve tried adding some content on Safari through the Send to Inbox services by clicking. Once this has been added, I find that the Shortcut now works… in Safari only. However, it still does not work on Mail. Sending content from Mail to Omnifocus Inbox through clicking on Omnifocus 3 : Send to Inbox does not have the same effect on reactivating the shortcut for Mail. Can anyone help me on this issue ? I had a similar problem but I think it was a conflict with another shortcut. I eventually tried CONTROL-OPTION-COMMAND-C and that “took” ok. I also use CONTROL-OPTION-COMMAND-SPACE for the Quick Entry window (though I hardly use that because it doesn’t add the project’s tags, only the ones I enter directly). Thanks for this feedback. Unfortunately, it doesn’t seem to work. I’ve changed my shortcut to various very weird combinations, with no effect. I’ve ran into the same Problem. It is not working in Mail. I have same issue. I just logged a support case. I have had this same issue for about a month now, what is the status of this? I use the clipping shortcut a lot and it is making OF3 hard to work with.